I met with a friend and her 14-month-old son today, and a fleeting interaction between the two reminded me again just how fascinated I am by human development. Basically, the little boy was in the process of doing something he wasn't allowed to do (dump his snack all over his stroller or the floor); he glanced up at his mother with a cheeky look on his face; she made a sort of "playful warning" face in return; he smiled back and didn't continue. Seemingly everyday interaction, but when I see something like this I am utterly fascinated. So many incredible things happened in those few seconds, and we take them for granted just because of how common they are. But when you really think about it - how did his mother know that his "cheeky face" meant "I'm thinking about throwing my snack, I want to see what you think about it; I want to see how far I can push it" ? And how did he know "my mommy's expression means I shouldn't continue this; it also means she understands I'm just being "cheeky" and joking with her" ? A myriad of other complex things happened in this few second interaction, but to me just these are enough to write pages about! As someone who's spent her entire life struggling to understand the complex social information encoded in the "subtext" of language, in facial expression, tone of voice, etc., the ease with which even an infant can do this makes the concept all the more fascinating to me. I have actually already written a thorough explanation of the basic phenomenon underlying the interaction between my friend and her son; below is a paper I wrote for a class last year that thoroughly (and in layman's terms!) explains the fascinating phenomenon of "joint attention", as well as how its absence in those with autism may be the root of their language and social difficulties. Deficits in joint attention (JA) may be one of the earliest indicators of autism (Murray et al., 2008), evident long before the more salient symptoms (language delay, social difficulties, repetitive behaviours) become observable. It is therefore important to understand precisely what is meant by joint attention, how it affects other aspects of development, how to differentiate it from other behaviours that appear to be JA but are not, and how to foster joint attention in those that lack it. Joint attention refers to a particular kind of attention that can be referred to as “social attention” – specifically, attention that is coordinated between two people and an external object or event. This enables both parties involved in the social interaction to have a “shared experience”. This seems like a simple, everyday occurrence – and it is, in typically developing children. But a number of fascinating things happen in these everyday moments. When a child points to an object, event, or entity, and then checks to see if the other person sees the same thing, a powerful thing happens: The child knows “They see what I am seeing, we are experiencing the same thing.” Not only this, but the child also knows “They know that I am seeing what they see.” The other person in the interaction also knows these two things. This is vital for social interaction. Without this shared knowledge and awareness that the knowledge is shared, conversation would be quite difficult. In this very similar scenario, there is one key difference: The child has no way of knowing if the caregiver is seeing what they see. Even if the child had no problems with language comprehension, the bird referred to by the caregiver could have been some other bird; the caregiver could have been on the telephone; or they could have been sharing that particular bird experience with a passerby. The child neither pointed out the bird themselves, nor checked the caregivers gaze to see if they were looking at the same thing. Because of this, the experience was not a shared one. When the caregiver says “That’s a pretty bird” or “The bird flew away; I’m sad too”, the child has no basis for connecting the words “bird” or “flew away” to any aspect of the event. The child also had no basis for perceiving that their frustration or sadness was seen and understood by the caregiver. Since a shared experience did not happen, not only is social conversation not possible, but neither is any aspect of typical language learning. Suddenly, the difference between a typical infant and an older autistic child becomes almost painfully clear. As outlined above, joint attention is often initiated by visual cues (eye gazes; pointing). Before language and the ability to move about, these are the main behaviours that infants have at their disposal for initiating a bid for joint attention. Infants are very sensitive to social stimuli as early as birth (Rochat & Striano, 1999); i.e., they are predisposed to orient towards faces (Frank, Vul & Johnson, 2009). By around 5 months of age, they begin to demonstrate sensitivity to very small shifts in the eye gazes of adults (by smiling and attending less if they perceive the adult is no longer looking at them) (Symons, Hains & Muir, 1998). It is thought that joint attention emerges at no later than 8-9 months of age (Mundy et al., 2007) and it may in fact emerge as early as 5 months (Legerstee, Markova, & Fisher, 2007). Joint attention skills then continue to develop in predictable patterns (Bruinsma, Koegle, & Koegel, 2004), and increase significantly between 6 and 18 months of age (Bakeman & Adamson, 1984). In comparison, children with autism appear to have severe delays in, or complete absence of many aspects of joint attention, with the difficulties continuing into late childhood (Loveland & Landry, 1986). The deficit in joint attention seen in children with autism is not necessarily a deficit of ability, but rather one of desire – those with autism do not appear to find it rewarding to attend socially or initiate social interactions; therefore they do no feel the need to respond to or initiate JA bids. Joint attention can be further broken down into two separate skills: responding to joint attention (RJA) and initiating joint attention (IJA). Responding to a bid for joint attention refers to an infant’s ability to recognize when another is drawing their attention to something, typically by pointing or looking at it. This ability can be assessed around 3-6 months by seeing whether infants correctly follow others’ gazes by turning their heads and/or eyes (Mundy, in press). Initiating a bid for joint attention is thought to be a more complex skill and to develop a little later. It involves initiating a shared experience (i.e. by pointing). It is important to understand and be able to differentiate between instances of true RJA/IJA from merely responding to behaviour requests (RBR), or initiating behaviour requests (IBR). An example of RBR would be an adult pointing to the last piece of broccoli because they want the child to finish their dinner, and the child complying by eating it. (Toppling the offending vegetable to the ground would also be an equally valid “response” to the behaviour request, yet still not necessarily RJA). An example of IBR would be a child pointing at a cookie, not to have the shared experience of admiring the baked good, but to simply request it for consumption. On the surface, RJA/RBR and IJA/IBR may look the same (they both involve either responding to points/gazes or initiating an interaction via points/gazes). The vital difference between the two pairs is the intent behind the initiation. If the intent is simply to gain access to a desired object (IBR), this is not true joint attention. The difficulty lies, of course, in assessing an individual’s intent, especially in populations that cannot necessarily be questioned verbally (i.e. those with autism). Joint attention has been shown to be important in the development of language (Bruinsma, Koegle, & Koegle, 2004; Kuhl, 2007). Kuhl (2007) has hypothesized that a “social brain” is necessary for language development. In an experiment that exposed 9 month-old infants to a foreign language, the results showed that those children who were exposed to it via television or audio did not show any evidence of learning, while those exposed to the language by a human being who interacted socially with them were later able to distinguish between the phonemes of the foreign language, something the other groups were unable to do (Kuhl et al., 2003, as cited in Kuhl, 2007). Since joint attention is a precursor to more complex social behaviours, it makes sense to hypothesize that it is necessary for language development – indeed, a longitudinal study which looked at 9-month olds’ understanding of referential pointing showed that this aspect of joint attention was related to later vocabulary gains at 24 and 36 months (Kristen, Sodian, Thoermer, & Perst, 2011). The theory is that if a child does not orient to adults’ gaze/pointing (RJA), they are deprived of situations to learn language. Similarly, if a child does not IJA, even situations of intrinsic interest to the child cannot provide opportunities for language learning (Mundy, in press). Therefore, a child with autism may experience deficits in language that are caused (at least in part) due to lack of joint attention. “Without the capacity for joint attention, success in many pedagogical contexts would be difficult. Imagine the school readiness problems of a five-year-old who enters kindergarten but is not facile with coordinating attention with the teacher. Similarly, children, adolescents and adults who cannot follow, initiate or join with the rapid-fire exchanges of shared social interactions may be impaired in any social-learning context, as well as in their very capacity for relatedness and relationships.” (in press). Mundy highlights the idea that considering those with autism as having a complete lack of responsiveness to other people is inaccurate. Many children with autism display levels of attachment that are on par with their mental development (Shapiro, Sherman, Calamari, & Koch, 1987, as cited in Mundy, in press). They are also able to learn form social modeling, respond when they are imitated, and make some use of eye contact and gestures to communicate (e.g. Mundy & Sigman, 1989, as cited in Mundy, in press). Mundy writes that, instead, the “lack of spontaneous seeking to share enjoyment, interests, or achievements with other people” (American Psychiatric Association, 2000) (in other words, initiating joint attention) is central to the understanding of autism. Children with autism are specifically lacking the desire to initiate or respond to social attention (not the ability), most likely because they do not find it inherently rewarding. Since joint attention behaviours can be seen in very young infants, while other measures of social skills must wait until the child is older, they are potentially a very useful diagnostic tool. Many have deigned methods to teach joint attention, with varying results. White and colleagues have done a systematic review of 27 studies that attempted to teach joint attention (2011). Success has been found with shaping RJA attention behaviours (i.e., teaching a child to respond to the tapping of an object, and gradually shaping to be able to respond to pointing). Most of the interventions for teaching joint attention were in the context of play. Teaching this skill during play is important, because it allows children to generalize the skill to other contexts. When desired behaviours related to joint attention were produced, some type of reinforcement was always used. While many of the studies seemed to show positive outcomes in teaching joint attention, one has to step back and examine the results critically. Meindl & Canella-Malone have also done a literature review specifically to examine what was truly being taught in studies that claimed to have successfully taught joint attention (2011). For example, out of 11 studies that focused on teaching IJA, 9 provided access to the object as a reward. Therefore it is unknown whether they were teaching true IJA, or simply IBR. The use of rewards other than social rewards is “particularly troublesome”, according to the authors. In natural instances of IJA, the “reward” by the initiator is never the object of interest – it is the social interaction itself. This raises the question of whether joint attention can be taught at all – for how does one “teach” another to become intrinsically rewarded by social attention? There are no easy answers to this question; however, it is something to keep at the front of one’s mind when developing or reading about methods for teaching joint attention. Because congenitally blind infants cannot initiate or respond to joint attention via conventional methods (points/gazes), do they have deficits in developing RJA and IJA? There are anecdotal clinical reports on the similarities between blind and autistic children (e.g. Brown, Hobson, & Lee, 1997; Hobson, Lee, & Brown, 1999). A case study of two congenitally blind infants was done by Bigelow (2003). She showed that these infants were indeed delayed in their development of JA. Because blindness makes it difficult to detect what others are attending to, infants must depend on others to initiate social interaction, and only after they develop language do they have a means of initiating joint attention themselves. Because most blind children eventually acquire JA, normal language, and social abilities, visual joint attention does not seem to be necessary for language acquisition. It may be possible that whatever methods are used to develop JA in congenitally blind children (i.e. tactile/auditory methods) may be useful for teaching JA to children with autism (Santo, 2011). It is clear that joint attention deficits play a great role in autism, and may in fact underlie most of the main symptoms, such as language delay and deficits in social ability. It is important to keep in mind the distinctions between RJA/RBR and IJA/IBR, especially when considering the literature on methods for teaching JA. Considering joint attention as the core deficit in autism is potentially a valid diagnostic tool for recognizing autism in very young children, and future research should focus on examining how best to do this. American Psychiatric Association. (2000). Diagnostic and statistical manual on mental disorders, (4th ed., text revision). Washington, DC: Author. Bakeman, R., & Adamson, L.B. (1984). Coordinating attention to people and objects in mother-infant and peer-infant interaction. Child Development, 55, 1278-1289. Bigelow, A. E. (2003). The development of joint attention in blind infants. Developmental Psychopathology, 52(2), 259-275. Bruinsma, Y., Koegel, R.L., & Koegel, L.K. (2004). Joint attention and children with autism: A review of the literature. Mental Retardation and Developmental Disabilities Research Reviews, 10, 169-175. Dawson, G., Toth, K., Abbott, R., Osterling, J., Munson, J., Estes, A., & Liaw, J. (2004). Early social attention impairments in autism: Social orienting, joint attention, and attention to distress. Developmental Psychology, 40, 271-283. Frank, M.C., Vul, E., & Johnson, S.P. (2009). Development of infants’ attention to faces during the first year. Cognition, 110, 160-170. Hobson, R.P., Lee, A., & Brown, R. (1999). Autism and congenital blindness. Journal of Autism and Developmental Disorders, 29(1), 45-56. Kristin, S., Sodian, B., Thoermer, C., & Perst, H., (2011). Infants’ joint attention skills predict toddlers’ emerging mental state language. Developmental Psychology, 47(5), 1207-1219. Kuhl, P. (2007). Is speech learning ‘gated’ by the social brain. Developmental Science, 10, 110-120. Legerstee, M., Markova, G., & Fisher, T. (2007). The role of maternal affect attunement in dyadic and triadic communication. Infant Behavior & Development, 2, 296-306. Loveland, K.A., & Landry, S.H. (1986). Joint attention and language in autism and developmental language delay. Journal of Autism and Developmental Disorders, 16, 335-349. Meindl, J.N., & Canella-Malone, H.I. (2011). Initiating and responding to joint attention bids in children with autism: A review of the literature. Research in Developmental Disabilities, 32, 1441-1454. Mundy, P., Black, J., Delgado, C., Pomares, Y., Van Hecke, A.V., & Parlade, M.V. (2007). Individual differences and the development of joint attention in infancy. Child Development, 78, 938-954. Mundy, P. (in press). Neural connectivity, joint attention, and the social-cognitive deficits of autism. In M. Legerstee, D.W. Halely, & M.H. Bornstein (Eds. ), The Developing Infant Mind: Integrating Biology and Experience. New York: Guilford. Murray, D.S., Creaghead, N.A., Manning-Courtney, P., Shear, P.K., Bean, J., & Prendeville, J.-A. (2008). The relationship between joint attention and language in children with autism spectrum disorders. Focus on Autism and Other Developmental Disabilities, 23, 5-14. Rochat, P., & Striano, T. (1999). Emerging self-exploration by 2-month-old infants. Developmental Science, 2(2), 206-218. Santo, A.L. (2011). Joint Attention in Autism and Blind Children: Effects on Language Development. Unpublished manuscript. Symons, L., Hains, S., & Muir, D. (1998). Look at me: 5-month-old infants’ sensitivity to very small deviations in eye-gaze during social interactions. Infant Behavior & Development, 21, 531-536. White, P.J., O’Reilly, M., Streusand, W., Levine, A., Sigafoos, J., Lancioni, G., Fragale, C., Pierce, N., & Aguilar, J. (2011). Best practices for teaching joint attention: A systematic review of the intervention literature. Research in Autism Spectrum Disorders, 5, 1283-1295. Vienna was a beautiful city; I cannot do it justice in words. I loved the never ending stunning beauty of all the old buildings, and the way it felt to walk among them. Everything is old; everything is full of history. It's like walking through a living, breathing past. Don't remember what this was... pretty awesome though. Famous Sachertorte from Vienna (chocolate cake with apricot filling). However, I eventually needed some green, so on our last day, I woke up early, and hopped on a streetcar to the Vienna Woods (Wienerwald). The landscape was very hilly, and the trees very tall. Even though I didn’t go very far along the trail, the woods seemed very secluded, as if I had escaped the city entirely. I just sat for a while, enjoying the quiet. Eventually I had to turn back and get back on the streetcar for our bus transfer to the nearby town of Gumpoldskirchen. We had seen in our itinerary that we were to have a reception by the mayor before our concert there, but none of us was quite sure what to expect. When our bus arrived in the small town, we were greeted by someone from the town, who walked us to the church we were to perform in later. It’s a wine-making town, so there were beautiful vineyards everywhere we looked. The town itself was full of beautiful little buildings, all originals from way back in the 1500’s. It was neat to walk around this quiet little town. It felt like we had stepped back into another time. Little did we know what was yet to come. We were walked to their tiny city hall where the mayor was waiting for us, and we all shook his hand as we walked inside. There was a long unbroken round table that circled the room, and the mayor and our conductor sat at the head of it. We felt very special and official. Our conductor and accompanist were presented with bottles of Gumpoldskirchen wine. 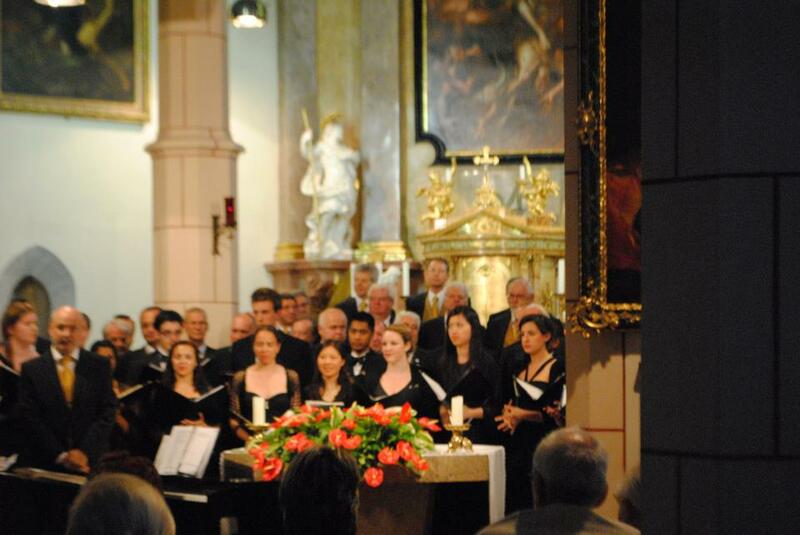 Gumpoldskirchen is apparently famous for two things: wine and choirs (they have seven of them!) We were then all given a small glass of wine to taste. The all-male choir, Mach 4, was there as well and performed a few pieces for us, which was awesome. YUCC and Mach 4 in front of Gumpoldskirchen city hall. Photo courtesy of this article about us. Then we were all taken outside and a small plaque with our choir’s name on it (and our country and date of visit) was attached to their wall of special guests. It was a pretty incredible afternoon. We hadn’t known what to expect, and we all felt so welcome and special. After our conductor got us all a quick bite to eat (which was very kind of her but also very wise – her entire choir had just had wine right before a performance!) we went to get changed and ready for the concert. As we walked over to the church, the bells were ringing, and people from the town were walking and driving up to the church to watch us. Our conductor said this is what they used to do in the renaissance – everyone from the town coming up to listen to music together. I can’t describe the concert itself- how do you put a musical experience into words? Mach 4 performed first, and I really enjoyed listening to them. They were very good – and there’s something very satisfying about listening to all-male choral music. Then it was our turn. As we went along and sang our other pieces, our audience reception just got better and better; after a couple of pieces, they just wouldn’t stop clapping! Apparently when they’re really impressed by a piece, that’s what they do. Then after our last one, they started the rhythmic clapping, which means they want an encore, so we did one of our pieces again and received even more applause. Afterwards, Mach 4 joined us on stage and we all performed a traditional yodeling song together (a very slow, calm one, that sounded like a lullaby), to the delight of the audience. They just wouldn’t stop clapping for us! I think we were all overwhelmed by our reception in that small town. Afterwards, we all went together to this delightful little tavern-like place, made of wooden logs on the inside and very low ceilings, and had a buffet of traditional Austrian foods. The wine was plentiful and kept coming - very generously offered to our table by the house. After dinner, Mach 4 spontaneously started singing, encouraging us to clap along or sing along if we could pick it up. Then it was our turn, and we sang “Locus Iste” – and of course everyone in the tavern joined in, because they all grow up with this music over there. We were all profoundly moved by the experience – everyone was so warm, so friendly. Even though many of the Mach 4 couldn’t speak English and none of us could really speak German, we were united by our love for music. It was our common language, and that evening in the tavern, with the food and wine and singing, with the genuine feeling in their eyes when we clinked our glasses and said, “Prost,” we all felt strangely at home, loved and connected. I’m having trouble putting the experience into words. It was just very profound in all respects. Who would have thought we would end up having such an incredible time in the small little town of Gumpoldskirchen?